Editor's note: This story is part of a series about one family's experience moving abroad to Germany. Read the next installment here. Four months into the school year, my husband accepted a job in Germany and we switched to a German Kindergarten. Suddenly, my son went from a day of structured work in reading and math to a day almost entirely filled with free play.When my son started kindergarten in the United States, it was just what I expected. He spent his days happily working on letters and numbers and writing. He did weekly art projects and had gym class twice a week. In the few months we were there, he even got to go on one field trip to a pumpkin patch. At parent teacher conference, I wasn't surprised to hear that he struggled a little with transitions and was good at math. Everything seemed just right. While Buddy wasn't the top of his class, he wasn't the bottom either. It was comfortable. It turns out that kindergarten in Germany is more akin to American preschool than American kindergarten. 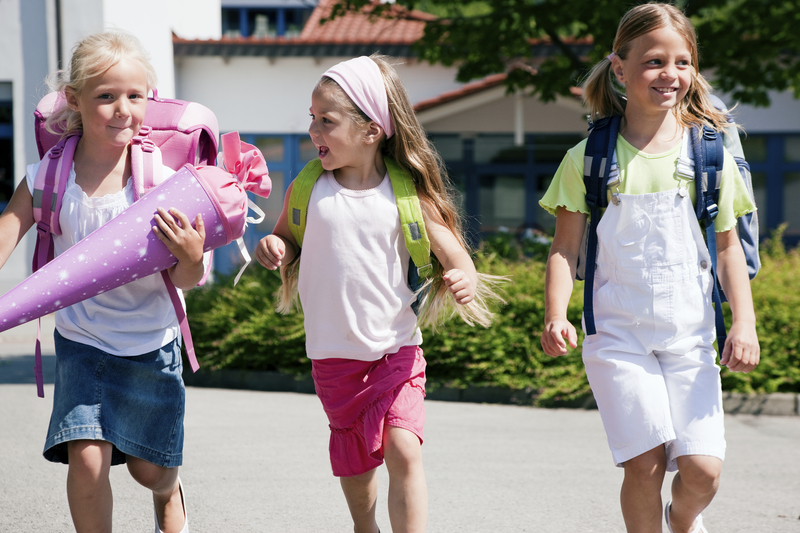 In Germany, school officially starts at age 6, with the first grade. Kids ages 3 to 5 can go to kindergarten, but it is optional (although most parents do enroll) and in kindergarten, academics are typically not emphasized, at all. You read that right. Academics are not taught. The kids don't sing the alphabet. They don't practice writing letters. There is no expectation that the kids will have any prior knowledge of letters or numbers when they start first grade. From my experience, the prevalent attitude in Germany is that learning to read and write is a rite of passage that all children should do together. Starting first grade is a big deal and the kids are bursting with pride at the thought of learning to read and write and become one of the schulkinder (school kids). I remember what the kindergarten readiness evaluation looked like in America. My son's preschool teachers quizzed him on upper and lower case letters and letter sounds. He was also asked to write his name, cut out a circle and identify numerals. In Germany, the first grade readiness evaluation was quite different. My son was asked to count objects but not recognize numerals. He was tested on his ability to discriminate between shapes and draw simple objects. He was never shown a letter. It was mind boggling. From my experience, the prevalent attitude in Germany is that learning to read and write is a rite of passage that all children should do together. Starting first grade is a big deal and the kids are bursting with pride at the thought of learning to read and write and become one of the schulkinder (school kids). Truthfully, I was okay with the lack of academics, but the lack of structure and supervision unnerved me. At my son's new kindergarten, there was a 30-minute morning circle time which felt very similar and comforting, but it was followed by school-wide free play. The kids would indicate where they wanted to go by placing a magnet on a bulletin board map of the school and then they would scatter to various rooms with different toys and activities. During the tour, I naively asked (via pantomime and simple English) if there would always be an adult in every room. The teacher just looked at me with pity for my over-protective American ways and said, “the kids don't need an adult in every room.” Cue deep breaths on my part. The structure of the rest of the day included a mandatory 30-minute garden time. And I mean mandatory. As the German saying goes, there is no such thing as bad weather, only the wrong clothes. Thus, all the kids were required to have rain coats, rain boots and rain pants. After recess came lunch, followed by (depending on age and parental choice) nap time, quiet time or gym time. In the afternoon, the kids were given more free time and if the weather was nice, forced outside for at least another hour. It should be noted that many kindergartens are half day in Germany just like in America but we chose to put our son in an all-day program to help him learn German as quickly as possible. Despite my anxiety, Buddy seemed to thrive. He came home from school every day all smiles with stories that would make my heart race. “Hey Mom, today I made an an ax but it broke when I hit a tree so my teacher helped me fix it with nails!” he would gush in a single breath. Or, “Mom, at the field trip a girl got lost but they found her.” (Every Thursday, the entire class would go on a field trip via the subway. I was nervous every time). He seemed to develop confidence and for the first time, he was making friends. This was a feat he had never quite managed in school in America. However, try as I might to adapt to the German way, there were a few things I just couldn't embrace. The lack of supervision always caused just a twinge of anxiety when I dropped him off. That lack, coupled with a general attitude that kids should work things out for themselves led me to begrudgingly resort to my husband's stance that it is okay to hit other kids to protect yourself — something I never would have said in America. I also wasn't completely comfortable with the zero academics approach. I realized this when my son's teacher suggested that maybe he wasn't ready for first grade. Buddy has a summer birthday and just like in America, it is very common to hold those kids back a year before starting school. It was a reasonable suggestion, considering the language barrier, but I was vehemently against it. To me it felt like we already had held him back a year. He already had missed a year of academics and I couldn't, in good conscience, let him miss another. It wasn't very German of me, and I could tell his teachers didn't agree, but my American heart couldn't take another year of unstructured playing. And that's okay. I am, after all, American.